Yeah, but: It's an excellent replacement for The Photographer's Eye. The Long Version: First of all, I like Steven Shore's photographs. Not everyone does. I like what he has to say with them, and I like what he says about them and many other photographer's photographs in this book. Not many people - even most photographers - are going to be as interested in this kind of introspection. It's impossible to look at The Nature of Photographs without also seeing the influence of The Photographer's Eye by John Szarkowski. They both deal with photographs as objects and as the results of decisions, and Shore wrote his book as an extension of a class he taught at Bard College that used The Photographer's Eye as a 'text'. Szarkowski's collection of photographs requires a great deal of inventiveness on the part of the viewer to determine why they were included - or perhaps a good instructor to guide the student would be ideal. Steven Shore must have taught a great class, because his book provides useful insights and instruction without stifling the viewer's own insights. The book opens with the question: "How is this photograph different from the actual scene that Robert Frank saw...?" 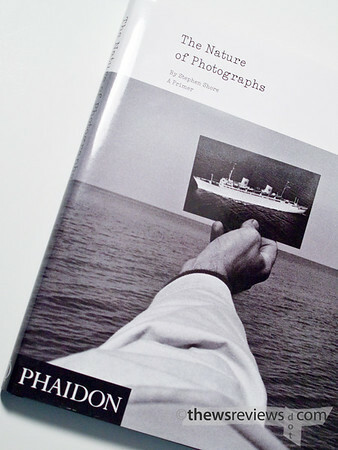 Teaching the viewer to answer that question for themselves - it isn't provided - and understand more about photographs as objects and as interpretations covers 125 pages and includes the work of over sixty photographers. Some photos are provided simply as further examples, but many of them have small notes about what they have been included to demonstrate, and they are collected into chapters detailing different aspects of an image. The influence of The Photographer's Eye is unmistakable, but the execution rises above its predecessor. The Nature of Photographs is a book about photographs more than photography as an act, and as such it's more intellectual than instructive. It certainly isn't for dummies. But for photographers who have moved past the technical instructions, and for others who are interested in an esoteric branch of media literacy, this is a book that's worth owning.